Amy fell in love with musical theater at a very young age while watching Leonard Bernstein and Julie Andrews musicals with her mother. In secondary school, she received vocal training while studying theater and dance and participated enthusiastically in school productions such as West Side Story and 42nd Street. She then went on to study world theater and dance on scholarship for two years at Barnard College in New York City, where she also trained at the Martha Graham School of Modern Dance. Upon transferring to Mills College in Oakland, Amy completed her Bachelors of Arts in Dance with an emphasis in performance and choreography. She then went on to perform with numerous San Francisco Bay Area dance troupes and choreographers, including Triada, Janet Welsh, Isabelle Sjahsam, Group A and Alyssa Wilmot, and Rebecca Pappas. After medical challenges required her to retire her dancing feet, Amy traveled abroad to teach English as a Second Language in Bordeaux, France, she then returned to the home and worked in fundraising for science education and social service programs throughout the Bay Area. 5 years ago Amy discovered Music Together® when her first child was a year old. Immediately falling in love with the program and feeling a sense of returning home, she spent the last five years attending classes with first her eldest and then her second child. Two years ago her husband gifted her a ukulele and she’s been jamming ever since. 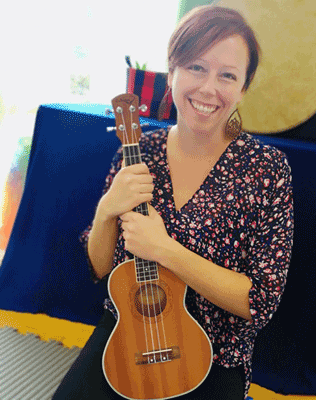 Amy passionately believes in creating safe and warm spaces where families and children can come together to play, improvise, and experiment with music and movement. She loves the Music Together experience, and its joyous ability to bring out the latent musician and dancer in all of us.